Our light brown sand finished 35mil poly covers have an unique ultra-fine sand texture that will complement any presentation or proposal. Excellent for use where strength and durability are needed, these 35mil sand poly covers are fully compatible with any binding system (see list below) and can be ordered pre-punched with your preferred pattern. These particular light brown sand poly covers are perfectly suitable unaltered or with added foil stamping or silk screening. Our window covers have a 1.75" x 4" window that is centered on the front cover 3" from the top edge. Take care in selecting the right sand poly cover for your needs---we carry nearly one thousand variations! Welcome to MyBinding video. This is Sand Poly Binding Covers. They come in sizes ranging from 5.5” x 8.5” up to 11” x 17”. You can choose to add a custom window to your covers or add rounded corners to your oversized cover sheets. Even select from 8 punch patterns to receive your pages prepunched or add a custom gold or silver foil printing of your logo. These covers come in a range of thicknesses from 16-55 mil. 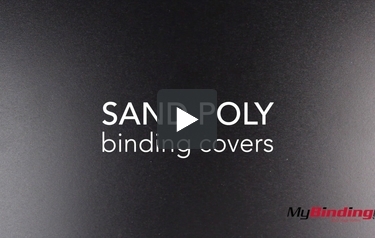 With these sand poly covers, there’s many colors to choose from. And since they’re plastic, they’re even water proof. Not only that, they’re tear proof as well, bringing you even more protection for your book. For more demos, reviews and how-to’s, go to MyBinding.com.